Detached villa with its own private pool, jacuzzi and garden. Quiet location though within short walking distance of the lively towns of Quesada and minutes away from the sandy beaches of Guardamar. Casa Davleen is a family-friendly, detached villa located in Quesada, within walking distance of the golf. Enjoy your own private pool and al fresco dining, with beautiful gardens and terrace space. Villa Blanca is your luxury home from home, just 15 minutes from the local beach, with a floodlit garden overlooking the sparkling Mediterranean. Enjoy peaceful family & pet-friendly surroundings. A 3 bedroom air conditioned house in the Gran Vista complex of Gran Alacant, with views over Carabasi beach. Features 4 pools, 2 tennis courts, 24h internet & more than 30,000 m2 of garden grounds. Detached, family-friendly 3 bedroom, 2 bathroom villa with private pool, floodlit garden and British TV. 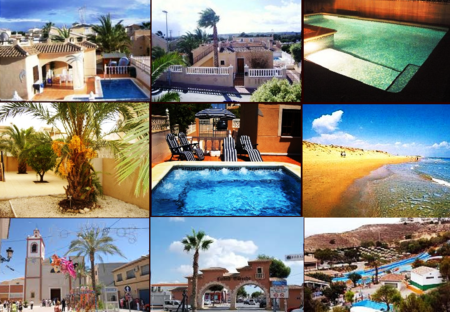 Located 20 minutes from Alicante Airport and 5 minutes to beach, shops pubs and restaurants. Lovely private country house. Set within a leafy, quiet location with stunning views, secluded and tranquil.